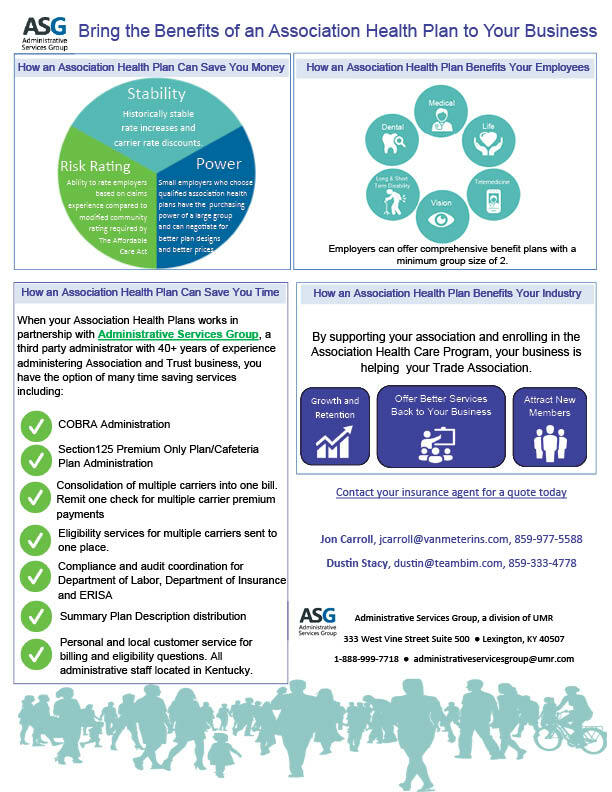 The Kentucky Primary Care Association is able to provide member employers with access to a comprehensive benefits plan, through the Association. The Association is able to offer a range of health insurance plans through Anthem Blue Cross Blue Shield and Delta Dental, with options on vision and hearing benefits. Participants may access cafeteria style plans for disability, life insurance, etc. The Member Clinic will work with the insurance broker designated to the Trust to best decide the organization's benefits for employees. The Trust has the potential to offer employer members access to quality benefits for employees at more affordable pricing. KPCA works with two insurance agencies, VanMeter/Houchens or the BIM Group, to guide members in assessing the rates, enrolling, followed by the attention and services needed to keep you and your employees happy. Administrative services of the Association Health & Benefits Trust are handled through ASG- UMR, Lexington, who have over 40 years of experience administering Association and Trust business. The Trust is governed by the Board of the Association with a member employer committee. To enable the agents to retrieve a competitive quote for your clinic, you must sign a note that makes them an Agent of Review (AOR). This does not mean the clinic is bound to that agent, it is just for that quote you are recognizing the Association agent and the line of potential business. The AOR is not a long binding contract unless you decide to accept the rates determined for your employees. This is Anthem's rule. Also, remember that while the health insurance might not be the cheapest, maybe the clinic can find savings in the other benefit offerings, such as the disability plans. Not only does the Association wish to help member employers to save money and provide quality benefits, but also to enable members in their efforts to recruit and retain quality staff. Click here to see PDF version of the flyer above.